I am beginning to see some similarities in my work, especially in portraiture, animals and figures. The top lion was painted this week. Bill is from a post in 2009. I leave you with a sing-a-long. I have probably sung this song more than any other and have never tired of it. Sometimes carrying it through a day with me, not able to get the tune out of my head. Thank you to LittleUkeleleMonster for these lyrics! 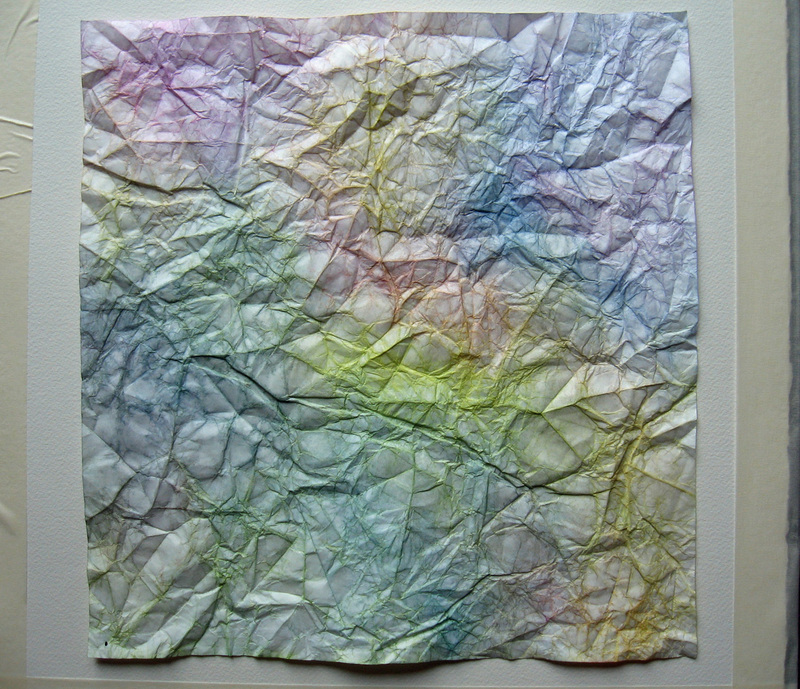 I began with this, a toned piece of masa paper. You can learn how to prepare this toned paper, here. 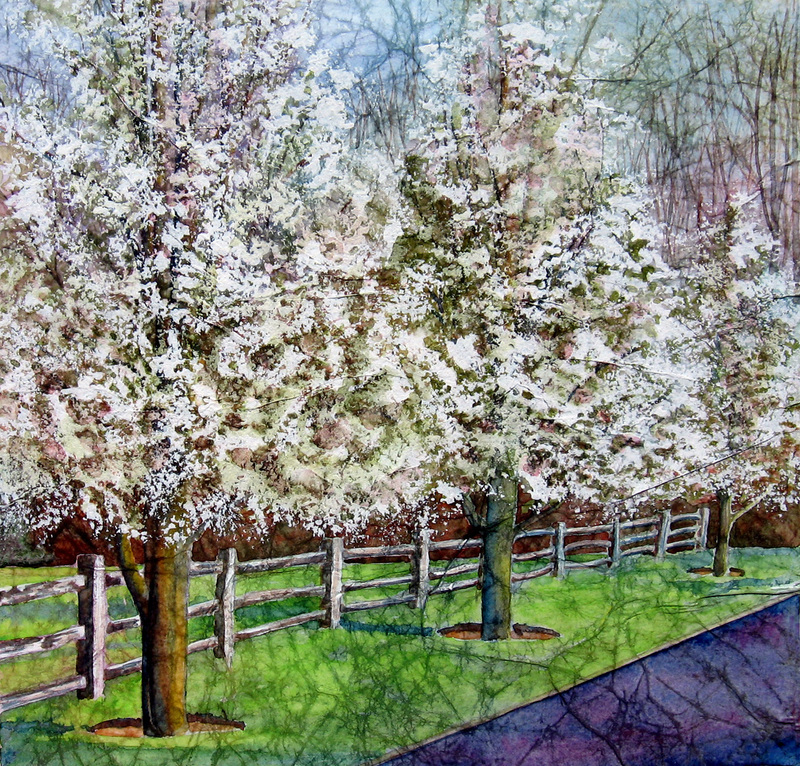 I did a very limited drawing to define the perspective of the three pear trees and how the fence diminished into the background. I then painted my first washes of driveway and grassy area. I used several colors of greens and yellows on the grass and red, yellow blues to color the blacktop. 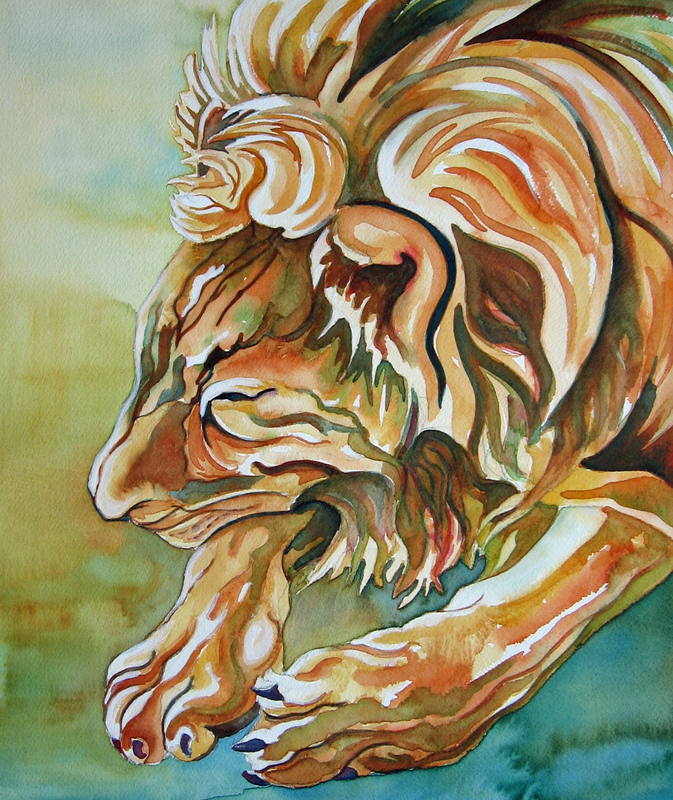 Multiple colors applied wet-in-wet help to create a glow. The grass and blacktop would appear flat and more like a coloring book had I not used several colors. In the next step, I painted the cerulean blue sky. Upon completing that, I noticed the driveway and grass looked washed out and re-painted both of them, darkening as I went. I also painted the first wash of shadows on the fence. I painted the dark area of the woods behind the fence and under the trees with a combination of sage green and burnt sienna. The next step was the most tedious part of the painting. 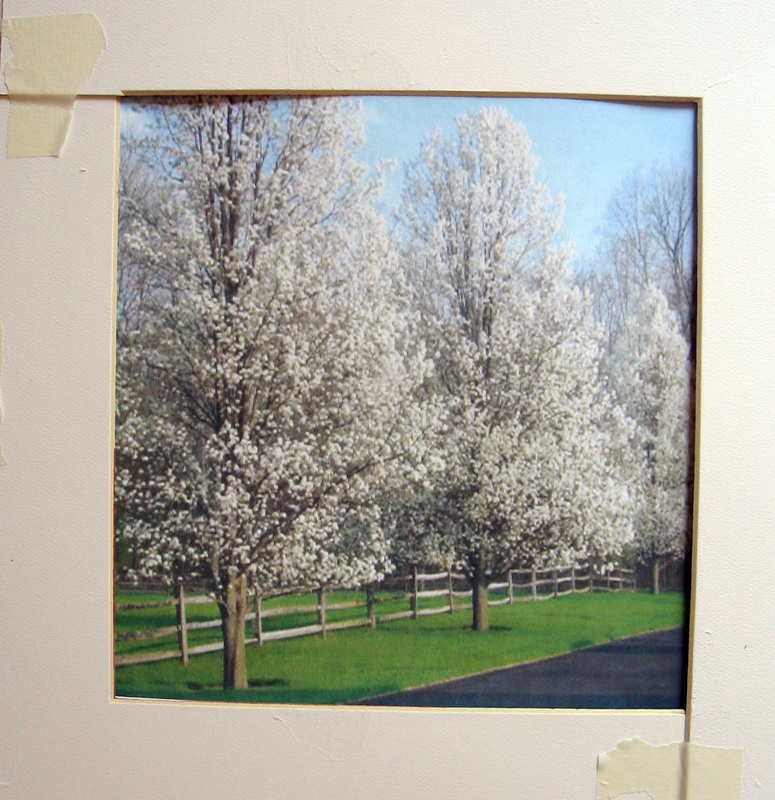 I intended to use gesso and a sponge to blot in the white flowers these trees would eventually have and could not imagine painting in every little branch through the sponge marks of gesso, so I took the time to paint the branches from what I could see of them. I used burnt sienna, prussian blue, new gamboge and olive green for the branches and trunks of the pear trees. I used olive green and sage green for the leafy forms I added in an attempt to begin to define the values in and around the leafyparts of these trees. I also fed in light washes of prussian blue and permanent rose for the warm and cool backgrounds I saw in and out of the blossoms on these trees. In short, I was attempting to define the areas of color that would peek through the gesso, once applied. I then took a thirsty sponge (one that has been soaked in water and squeezed to get all the drippiness out) and dipped it lightly into gesso and blotted it on scrap paper (to take out big blobs) and began blotting in the white flowers on the trees. I was careful to select a sponge that would create the kind of texture I wanted as sponges vary. This took some time and a great deal of patience as I had to keep dipping and blotting to prevent large blobs of gesso from being applied. To complete the painting I painted in the branches of the woods in the background with a rigger and color mixtures of burnt sienna and the greens and blues I had used in the rest of the painting. I worked my brush in and around the gessoed areas to define the shadow areas of the three trees and applied white gouache to the lighter areas of the split rail fence. The grass required another touch up of yellows and greens as it appeared washed out again after I had worked on the back ground and shadows within the trees. This is a scene to the east of the driveway of the place where I plein air painted last summer. You can see them as you come up the long driveway I featured in this post here titled “Coming Home”. That was all it took. I have been sharing creating art with my Granddaughter ever since she was a little older than one. I made a few rules for myself, early on. I told myself that I would not interfere with her vision and listen carefully to what she said. I also decided that she would use my professional materials and I would need to be vigilant so nothing would go in her mouth that shouldn’t . The only exception to the second rule was when we would find something “Awesome” that was made for children and we, both, could not resist trying it. There is nothing I dislike more than seeing a child given inadequate tools to create art. If the color is not bright and the materials are difficult to work with, how many would be inspired to continue? Oh well. That’s a bug-a-boo of mine. The last rule was that I would NOT push her. I would offer to share creating art with her, but not make her. This has worked for us. We drew our still life. I suggested she look carefully at the objects I had grouped on the table and that she pretend she was tracing their shape on the paper. She immediately got up from the table and began drawing the objects as I began mine. “You can sit and draw what you see of them from your seat.” I responded. I watched her circle the table and draw each one. Note I have eight glass objects and she does, too. She studied each object very diligently and drew with such care. She then sat back down with her drawing in front of her and looked over at mine. I heard a little gasp. 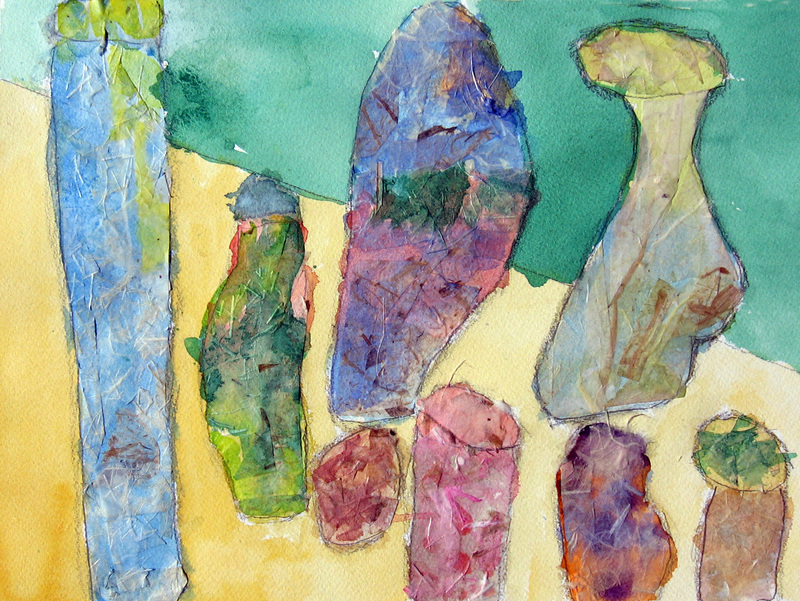 We, next, painted our still life drawing with watercolor and allowed it to dry overnight. I pointed out to her some of the things I noticed in her drawing like how she got the perspective correct for the openings at the top of her vases and bottles; the way they actually looked. The one vase curves outward at the top and has a rather large bowl at the bottom. She got the tall and straight one and the oval looking one beautifully. The other thing I was amazed with is that she had them proportioned pretty well in comparison to each other. Sometimes I think we rush children too much. They do not “see” the same way we see. We often rush to judgement in our desire to perfect them and don’t give them time to grow in steps. I forget what approach in art it is to circle objects and put the shapes together. Does that have something to do with cubism? Did my Granddaughter just do a little of that to organise what she saw sitting before her? Her shapes aren’t perfect, but either are mine. She was studying them or she would not have the perspective correct or the proportions. I have viewed art like she has created, above……. and it makes me want to search through old classics and modern art and all there is out there to connect. I guess my point is that I learn every bit as much from watching her as she does by watching me. The other thought that comes to me is how important it is to share anything with our children and Grandchildren. Anything! Fishing, bike riding, swimming, reading, cooking! Their exposure to sharing what we do is so valuable. We are helping them to communicate, learn something they can do in their spare time their entire lives and we are offering them a way to have confidence in themselves. …and probably much more. We allowed our paintings to dry overnight and the real fun began. We cut all sorts of rice papers up and glued them to the surface of our glass objects we’d drawn and painted. We used acrylic matte medium with a little water in it and applied it to the support and collage papers, overlapping the rice paper shapes as we went. After allowing that to dry overnight, we again painted the glass objects to achieve the finished paintings, above. If you click the above images, you can see the different textures of the rice papers we used. This painting caused no end of grief for me. I thank wet canvas for the photo I used as a reference for this. I was attracted to the strong light cast on the scene of the three tigers and that was my initial challenge. The other challenge was choosing the colors I wanted to use to render the scene. 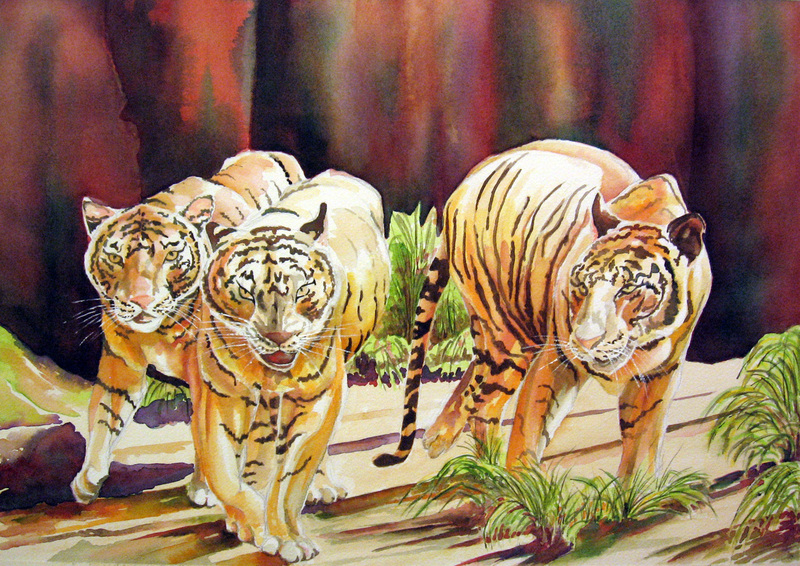 The final challenge was my desire to get the feeling of the expression each of the three tigers emulated. I finally decided on a palette of greens, violet, earthy reds and orangey-yellows. I don’t know how many times I had to go back into the stripes on each tiger, but it was quite a few. I mixed my reds and greens for the darks of them and added a little violet to darken them. I used halloween orange, raw sienna and burnt sienna for their coats. I would shadow their forms with light washes of sage green and olive green. The white on them, with the exception of the whiskers, is the white of the paper. The whiskers were drybrushed using titanium white. As I painted, I realised why I struggled so much. 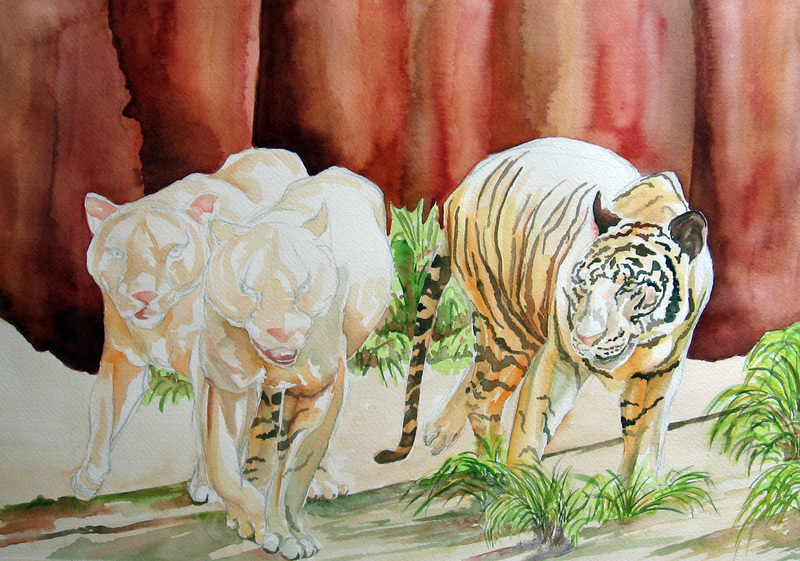 I have painted quite a few portraits of animals and people but rarely in a grouping. I also realised that I rarely include the entire body of many of the animals I paint. This is something I think I can add to my list of imagery to work on. I would like to learn to see groups of things a bit better than I do now. Tigers are endangered. The major reasons are something humans have caused. More about that here. Not long ago, I posted a new technique I had learned, here. I would like to add some furthur updates to this as there are two bloggers who have tried this. One is Louise who blogs poems, photos and paintings here. The other is Beth who is continually exploring new things, also, found here. Thank you to both of you for trying this and I hope it opens new doors in the world of watercolor. In Beth’s and my discussions, back and forth, she mentioned that she had used something different than I do to adhere the masa to her watercolor paper. I am wondering if the fact that I use acrylic matte medium for the glue, gives me the opportunity to lift paint as I work and also helps to set the tone and darken the pattern when I adhere it to the surface. So… today I photographed my process showing you the toned paper before glueing it and then again the darkened color that appears after I glue it. …and glue it to the surface of a pre-cut and taped down piece of 140lb coldpress watercolor paper. I cover the top side with matte medium with my 2 inch brush, also, encouraging the paper to flatten and the wrinkles to crease over so I get a tight seal of paper to support. This is when it darkens. I don’t know why. Perhaps the acrylic matte medium helps. If you are not getting enough color into the cracks, try using a couple dark staining colors. I used all dark staining colors on this one. They were aureolin, prussian blue, halloween orange and permanent rose. A few times, while toning, and prior to drying and glueing the paper, I have stroked some color into the front side also. This makes the toning even darker. I hope this update helps. Please don’t hesitate to ask questions if you are having problems while trying this. 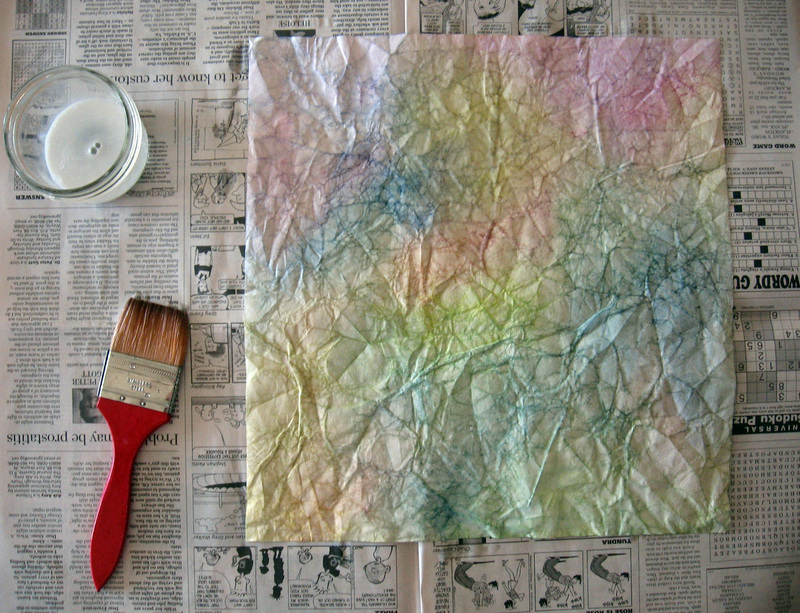 The paper is very fragile when it is wet but not so when dry. That is why I glue it down with a soft brush. Have a great start to a new week everyone! 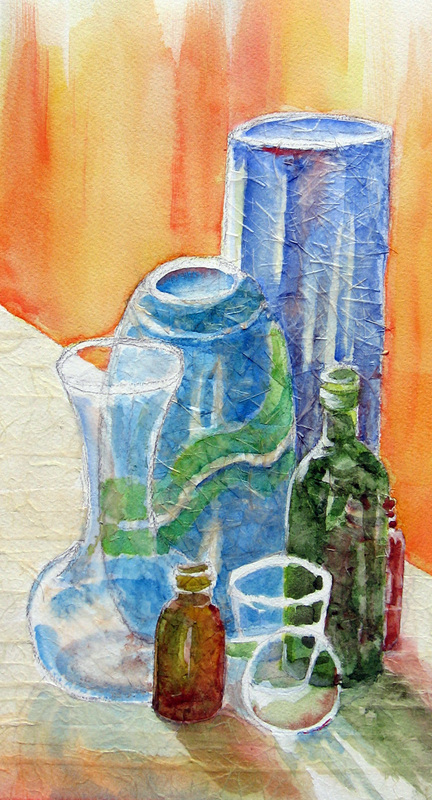 I am continuing my studies in the Watercolor and Collage Workshop book by Gerald Brommer. Let me say that there is a whole host of information in this book and anyone interested in this method of painting would find it full of suggestions and techniques to get you started as well as to inspire you furthur. My images fall short of his and I have a long way to go to master these techniques. However, I LOVE THIS. Working on these feels like I am really adding a part of myself to the piece more than anything I have attempted other than continuous line drawing. It has caused me to feel my way through the composition and given me a little bit of a voice through my experimentation. The above painting/collage is 4.5″ x 13.5″, so not very large. It was practice in beginning with a painting and applying papers and white watercolor to enhance the painting rather than to fix it. Mr. Brommer talked about the use of white in our work for more than just a “fix” but for part of the composition, as a whole. I liked that. followed by defining the value pattern that I saw using darker greens and blues. I added a suggestion of the trunks leading up through and behind the leaves using yellow and burnt sienna and then began glueing a nice transparent white rice paper that had long and curvey threads running through it. I use a mixture of acrylic matte medium and a little water as my glue and apply it to the papers with a brush. I do not “glob” it on but apply a little to back of paper and then stroke a little on the top surface of the paper to adhere it in place. 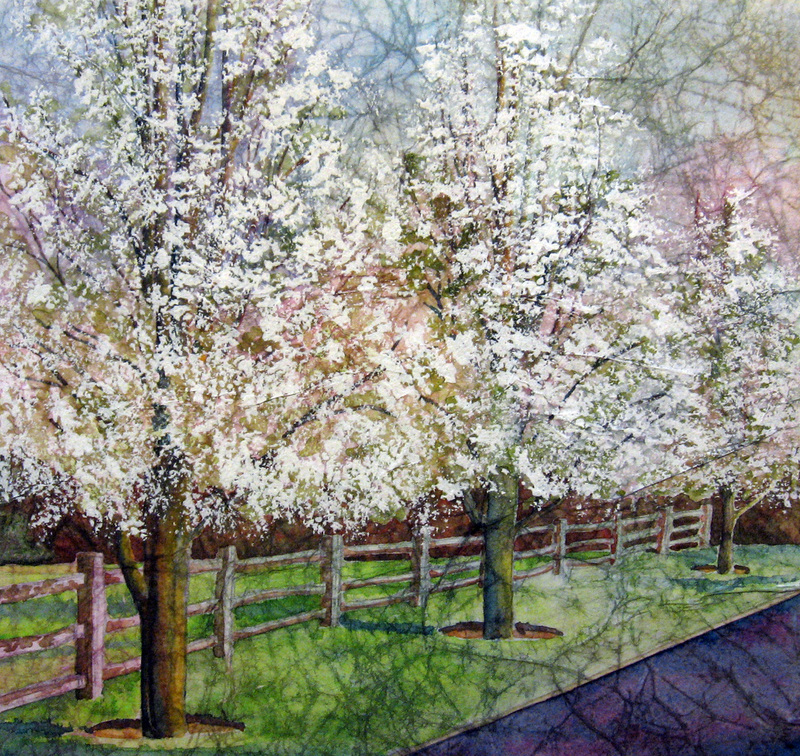 I was careful to choose how I wanted the threads in the paper to flow along the branches. I did not just tear pieces and apply them haphazardly. This stage of the painting took me the most time. The above is how this painting looked when I was done glueing the rice papers to the surface. This was the most fun stage of the painting. My painting had deviated from the reference so much that I was able to just enjoy enhancing what I had created. I darkened areas around the boughs of the branches trying to be mindful of where the light was filtering in from the upper righthand quadrant. I did not worry that the papers had changed the look of the leaves from the original reference and imagined pine boughs, instead (those huge droopy ones). 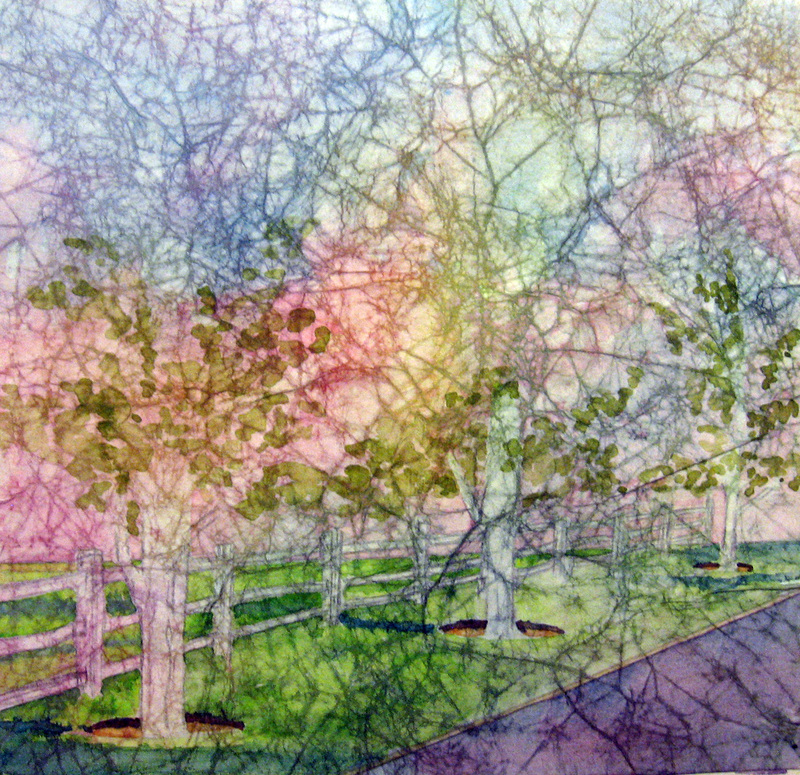 To finish, I took Brommer’s suggestion and used some titanium white and painted in rays of light filtering through. 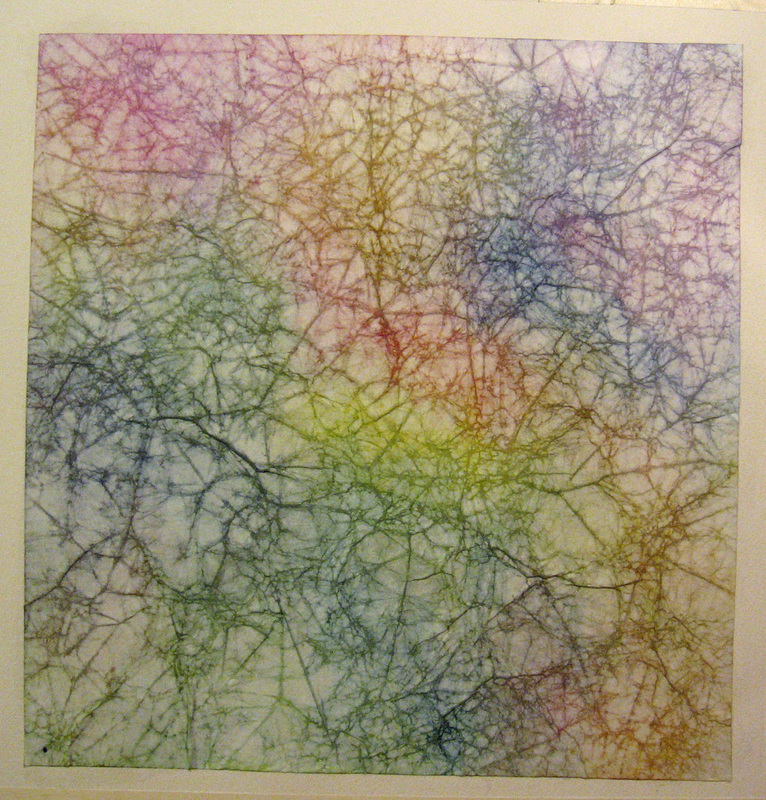 I enjoyed this one so much, I did another using a rice paper with little choppy threads in it. This one came out looking more like maple or oak leaves might. I would also like to announce that there are two art shows coming up in our community in the next two weeks. 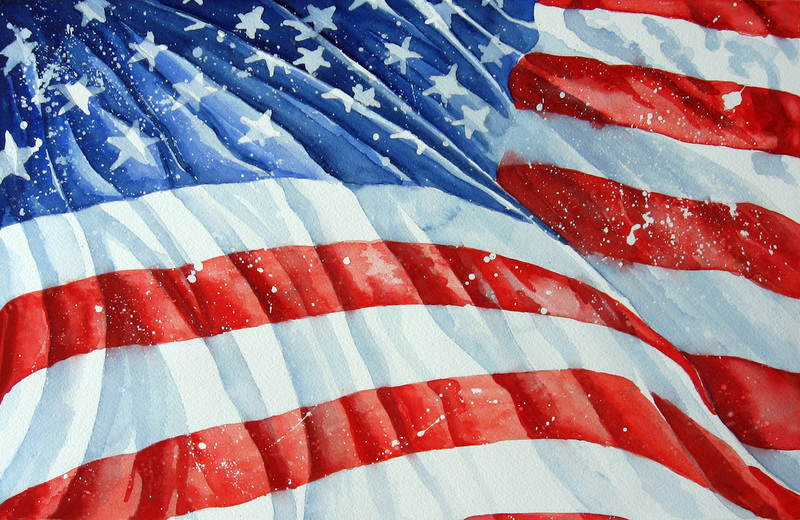 The Fort Wayne Artists Guild juried show’s opening is Friday July 8th from 7 to 9 pm. in the Jeffrey Krull Gallery on the first floor of the Allen County Public Library. The show will hang through August 20th during normal Library hours. Artlink’s Annual Members’ Show will open Friday July 15th from 6 to 9pm. This show will hang until August 10th and can be viewed during normal Artlink hours. These are my two favorite shows each year and a great representation of local artists’ work. If you are in the area, you may wish to stop in and view them.